We produce pet strapping (polyethylene terephthalate strapping) from 10mm width to 25mm width. Polyester PET Strapping Band is replacing Steel Straps as the preferred choice in load securement. 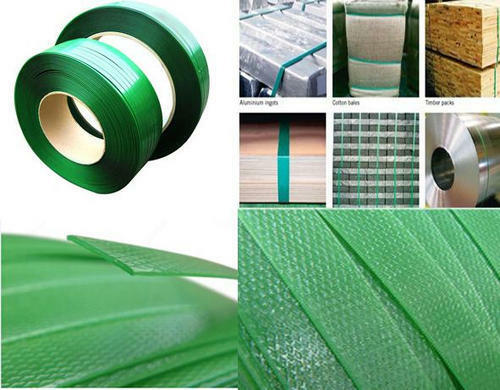 PET strapping has low cost, saving, environmental protection, durable, high tensile strength features, pet strapping improve handing efficiency advantages, increase the stacking space utilization rate. Incepted in the year 2010, we “Omniscient International” are engaged in manufacturing a wide assortment of PET Strapping Rolls and polypropylene strapping Rolls with a mission to provide a full range of high-quality plastic strapping solutions and to serve the customers with exemplary quality products at most affordable rates. In a very short span of time, OMNISCIENT STRAPS has reached to a towering height & created a pride in several eyes by 3D (dedication, determination & devotion) with staunchly working. Highly professional establishment with improved and new theme of International business in packaging material like OMNISCIENT STRAPS is generating good response from international market. We stand ahead in this line on the basis of quality, reliability and durability of our strapping. That is why, in this era of high moral, latest business styles and professional touch, we are able to satisfy well by supplying qualitative straps. Our complete commitment to the best strapping quality, service and prices will help the company take great strides in future. Our straps are with complete varieties, quality assurance, strength and international standards. We adapt to market demand, constantly innovate and wholeheartedly provide customers with high quality products. We are acclaimed for our commendable quality and timely service. We hope to establish good cooperation with more companies in domestic and overseas markets. Our management of production strictly refers to ISO quality certificate system, sticking to the principal of "Quality is always in the First Place". Quality Control is conducted in every process of our products. We perform tests on our straps for width, thickness, breaking strength, length, splitting strength and flatness so that our customers have no worries about our products. The entire production process is automatically controlled. This greatly reduces our labour costs, making us more competitive in the industry. It is our policy to do our best to achieve what you have thought of and exceed your expectations by doing what you have overlooked. "Honest, Sincere and Down-to-Earth spirit, and Achieving what you have promised".